Burgess tell me they've been appointed exclusive central agents for sale of the 70m motor yacht, Tankoa S70, under construction in Genoa, Italy. Built to dual classification under Lloyds and RINA and MCA compliant, the Tankoa S70 will be an impressive new delivery with quality construction and well recognised design credentials. The yacht is well specified and modifications are still possible according to the client's wishes including an LOA from 70 to 72m and various interior design options. The yacht provides a spacious and attractive accommodation layout for 12 guests comprising an Owner’s apartment on the upper deck with private deck area, a full beam VIP suite and 4 further guest suites on the main deck. Spacious open interiors are complemented by expansive outdoor areas on each deck. 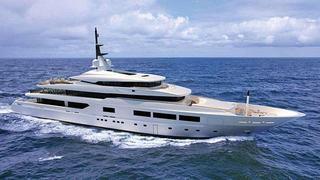 Ready for delivery 24 months from contract, the Tankoa S70 is asking €45 million.